An 1859 portrait of Alexander von Humboldt by the artist Julius Schrader, showing Mount Chimborazo in the background. Aphorismen aus der chemischen physiologie der pflanzen. Aus dem lateinischen übersetzt von Gotthelf Fischer. Nebst einigen zusätzen von herrn dr. und prof. Hedwig und einer vorrede von herrn dr. und prof. Christ. Friedr. Ludwig. 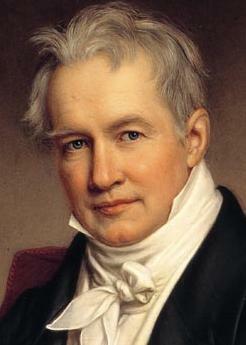 Rupke, Nicolaas A., Alexander von Humboldt. A Metabiography. Corrected edition. (Chicago and London: University of Chicago Press, 2008). HiN-International Review for Humboldtian Studies Biannual open access journal on transdisciplinary studies concerning Alexander von Humboldt (ISSN: 1617-5239). With articles in English, German and Spanish, both as HTML and PDF. A project by the Chair of Romance Literatures, University of Potsdam, and the Berlin-Brandenburgian Academy of Science.